The departure of manager Remi Garde after less than five months in charge is the latest desperate episode in a story of chaos and crisis that will soon end in Aston Villa's relegation. Garde's exit is just another piece of the wreckage piling up around Villa Park as they lie hopelessly adrift at the foot of the Premier League with 16 points from 31 games, 12 points from the safety of 17th place with only seven matches left. The Frenchman follows chief executive Tom Fox and sporting director Hendrik Almstadt out of the club. Villa's demise is a shocking tale of mismanagement that is taking the club into the Championship with no guarantee of a swift return - and Garde leaves after an ignominious and short reign. How does Garde's record compare? When Garde was appointed to replace Tim Sherwood on 2 November, he came with a glowing reference in a rare public utterance from owner Randy Lerner. Lerner said: "Remi arrived with honesty, humour and a steely sense of what it will take for Aston Villa to be what it is meant to be - hard working, tireless, creative and unwilling to concede." Hollow, almost ironic words now as Garde leaves with only two wins and 12 defeats from 20 games, that 10% win ratio the lowest for any Villa manager who has been in charge for at least 15 games, even worse that the 18.4% for Alex McLeish, who won only seven of his 38 games. For all Lerner's supportive words, Garde can rightly point out the backing was not there when it mattered, namely when not a single player was signed in the January transfer window at a time of desperation as Villa's fate already looked sealed. Garde was hopeful of doing deals for Seydou Doumbia, the CSKA Moscow striker who ended up on loan at Newcastle United, and a move for Croatian goalkeeper Lovre Kalinic also failed to materialise. It sealed his fate. His spirit was soon sapped and Garde's body language and rhetoric has taken on the air of a defeated man in recent weeks. Whether Garde was given a fair chance is open to debate but it can be added to the list of ill-fated decisions by Villa's hierarchy. Villa's decline has been coming for years - although this season the pace has changed from a stroll towards the abyss into a Usain Bolt-style dash towards the drop. It can be traced to the shock walkout of manager Martin O'Neill just days before the start of the 2010-11 season. Since then, the club's story has been a tale of managerial instability, poor appointments and a seemingly inevitable march towards the Championship. They finished ninth that season under Gerard Houllier but his reign was short-lived. He stepped down in June 2011 after only nine months as he needed time to recuperate from heart problems that had troubled him the previous season. Since then the graph makes grim reading. In the past four seasons Villa have finished 16th, 15th, 15th and 17th - if the danger signs were there they have not been heeded despite being written in large red numbers. The appointment, in June 2011, of Alex McLeish - the man who had taken fierce rivals Birmingham City into the Championship while winning the League Cup the previous season - was a PR disaster and was symptomatic of the erratic, sometimes inexplicable, decision-making under Lerner. The longevity - or lack of it - of the managers brought in by Lerner also shows the drift and decline being suffered at a club that has all the infrastructure to be a Premier League superpower, with a magnificent stadium perfectly situated right off the M6, rich history with a European Cup win in 1982 and a huge fanbase in the second city. Since O'Neill's departure after 152 Premier League games, Houllier lasted just 33, McLeish a full season of 38, Paul Lambert a relative lifetime of 101 before Tim Sherwood's tumultuous 23 matches, which at least included the sideline of an FA Cup final appearance last season, albeit a 4-0 thrashing by Arsenal. There has also been a talent drain away from Villa Park since the summer of 2009 - although Villa have almost always received top dollar in exchange. Powerful statements, such as the £18m deal for Sunderland's Darren Bent in January 2011, have been rare, with most of the other heavy traffic travelling the other way. Gareth Barry left for Manchester City for £12m in June 2009 and was joined by James Milner in a £26m deal in August 2010. Ashley Young went to Manchester United for £17m in June 2011, while Stewart Downing went to Liverpool for £20m in July 2011. And only last summer, main goalscorer Christian Benteke joined Liverpool for £32.5m and captain Fabian Delph was another off - to Manchester City for £8m - mostly good business financially but not necessarily the actions of a club high on ambition. Ex-England manager Graham Taylor, a former Villa boss who continues to live in the area, told BBC Sport: "I am like a lot of the supporters - I can't believe what I'm watching. I don't know where it is going to end other than in relegation and it doesn't mean to say it will be the signal for automatic promotion back either. "I have never known it so low at Aston Villa. Both the club and its supporters are at such a low ebb. "Somewhere along the line the feeling around the club, with the owner wanting to sell and not being able to, has crept into the dressing room. It is like a slow death in football terms. "For me there are too many non-football people running football clubs in this country and one of those is Aston Villa." Where does this leave Randy Lerner? Villa's American owner is a distant and disconnected figure - rarely seen at games and still searching for a buyer for the club after putting it on the market 20 months ago. He has become increasingly unpopular as Villa remain rudderless, that white flag of Premier League surrender effectively being waved since the inaction and inertia of that January transfer window. Lerner has been shuffling Villa's boardroom around, inviting quips about deckchairs and the Titanic - and Villa fans will need to see hard evidence of progress before they regard it as anything else. West Midlands businessman Steve Hollis is now chairman, while former FA chairman David Bernstein and ex-Villa striker and manager Brian Little have joined a revamped board. Former governor of the Bank of England Mervyn King is also a director while former FA executive Adrian Bevington has been working with the club. Lerner's presence remains a problem, however, because he clearly wants to sell, but the lack of takers means he is stuck in a loveless marriage at a club for which he once had such high ambitions. Lerner agreed his purchase of the club from Sir Doug Ellis for £64m in August 2006 and estimates of his current asking price range from between £150m to £200m, but there are no potential buyers in sight and relegation will surely drive away any big-money interest. "When you have owners who are looking to sell and the results on the pitch aren't going well, it leaves a distaste about things," added Taylor. "The owners at the moment haven't been able to sell and I don't think, particularly with the threat of relegation, that they are going to get the money they're asking. Would a potential buyer risk a lot of money on a club in the Championship? I don't think so." So it seems, through thin and thin, Villa's fans and Lerner are currently stuck with each other. Is Lerner the man to blame? 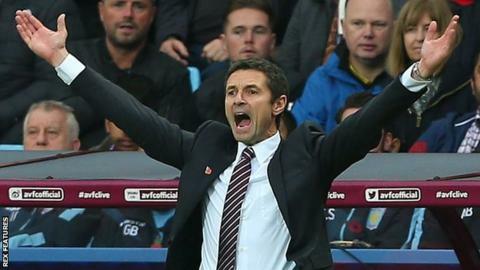 BBC Sport's Pat Murphy: "Remi Garde is the latest manager to feel let down by Lerner. No-one would've blamed Garde if he'd walked out when the January transfer window closed after he'd been promised new signings when he was appointed in November. "Lerner must take major responsibility for Villa turning from relegation sleepwalkers into headlong dashers towards the rocks. "When he took over in 2006, he accomplished many good, well-intentioned things, exuding respect for the club. Above all he was ABDD - Anyone But Deadly Doug - but Lerner has achieved the improbable feat of making many Villa fans realise that the old boy wasn't so bad after all. "At least 92-year-old Sir Doug Ellis still turns up at matches, home and away. The absentee Lerner's made it clear for a long time that he wants out. "Putting the club up for sale in May 2014 was a serious misjudgement. He was counselled against it by several close advisors but many billionaires have an obdurate streak - how else to justify hiring the former Birmingham manager McLeish, amid great scepticism and hostility? "Why else has Lerner ruled out giving a press conference since May 2010? He is an articulate, voluble man but sees no need to communicate with the supporters via the media, other than occasional banalities via the club's press office. "Once the club was on the market, with a failure to secure a quick deal, the impression has solidified of drift, inertia and delusion that it will all come right soon enough. Lauding Villa's enviable history, stadium and status while the roof's falling in is just averting the eyes to reality. "It was a major failing not to have experienced footballing nous on the board until Bernstein and Little (the latter in an advisory capacity) were recently brought in. "In nine years in charge, Lerner has got through four chief executives and six managers and counting - three of those in 2015, hardly the acme of stability. He and his cohorts may coo over increased commercial turnover and promising revenue streams, but that means nothing to the fans. "Lerner cannot be held totally responsible for the current mess, but the key appointments he has sanctioned in recent years have not improved results on the field. As the Sicilian proverb notes, the fish rots first at the head." The worst season to go down? There is never a good season to get relegated - but with vast riches about to float into the Premier League as a result of a new TV rights deal next season, a departure now will be acutely painful in football and financial terms. The Premier League announced the new deal, worth a record £5.136bn, in February, a 71% rise on the last agreement. It means that even the club that finishes bottom of the Premier League in 2016-17 will pocket £99m and the champions will earn more than £150m, even before additional fees are paid to clubs that stage more TV matches than others. The vast majority of the Premier League clubs could break into the top 30 richest in the world as a result - Villa are now destined to miss out.